George Takei got his big break as Hikaru Sulu in the original Star Trek. These days he is better known for his LGBT activism and being one of the most popular celebrities in social media (500K Twitter and 3M Facebook followers). He is known for his hilarious posts that spread like wildfire and the occasional advocacy he slips in. George Takei’s family went through internment in WWII. It seems like his tolerance and advocacy style comes from those days. He uses humor and like-ability to turn people’s opinion on controversial topics. Rather than arguing and being, as he put it, “overly serious”. Definitely something I could learn. George Takei’s insanely popular Facebook page was originally launched to promote “Allegiance”, the new musical he has been working on for the last two years on the topic of WWII internment. It has broken all box office records and is now officially heading to Broadway. The topic is serious and his team knew that most people are not particularly interested in advocacy. Hence the humor with an occasional serious post. All in bite-sized pieces and easy to share. George spent a good bit of time talking about LGBT issues, how he became such an outspoken activist on the topic, and his advocacy style. Though he was out for a long time in Hollywood, he began speaking up in 2005 when Arnold Schwarzenegger vetoed AB 849, the first gay marriage bill to have been passed by a legislature in the US. He was incensed as apparently Schwarzenegger was seen as a Hollywood insider who understood the LGBT community he has worked with for years in the arts. 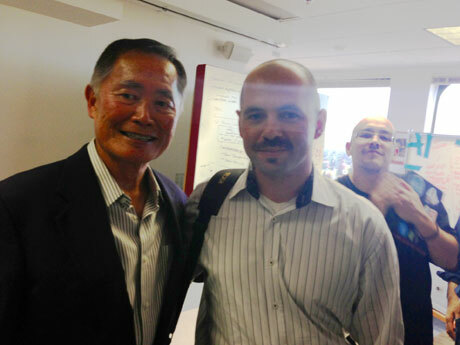 There are a number of celebrities who are advocating for gay rights, however George Takei’s humorous style and like-ability is what is disarming and so effective with the opposition. Another thing I noticed is his incredible acuity as he was taking questions from the group. He remembers names like the best of politicians and is crystal clear in remembering and answering questions. A skill that only comes with many years of practice. Amazing sharpness for a 25 year old, let alone a 75 year old. A memorable experience. Thanks Mr. Takei and thanks 500 Startups!